Ika Widiyasari is a Master of Public Policy student at OSU. She received her Bachelor’s degree in economic statistics from the Institute of Statistics in Jakarta, Indonesia. 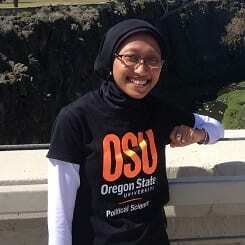 Prior to coming to OSU, she worked in Indonesia’s Statistics Bureau for almost 7 years. This first-hand awareness of her home country’s impoverished social and economic conditions in remote areas prompted her to pursue a graduate degree in public policy with a focus on rural policy. She is working with Hilary on the community reactions to extreme weather project.